He got two years probation and 160 hours community service. A man who was caught and arrested affixing racist and homophobic posters to University buildings on behalf of a militant neo-Nazi group was sentenced at the end of last month to two years of probation on a disorderly conduct misdemeanor offense. Matthew Urbanik of Schaumburg, Illinois, will have to complete 160 hours of community service, and he was required to pay $1,040 in restitution to the University’s Facilities Services for damage caused by his use of a spray adhesive to hang the posters, court documents show. The case was disposed on August 24 as a Class C disorderly conduct misdemeanor—the least severe of Illinois’s three classes of misdemeanor offenses—after prosecutors originally charged Urbanik with a felony for property damage. A University of Chicago Police Department (UCPD) official said at a forum in March that the UCPD pushed for a felony hate crime charge, but the state’s attorney did not find enough evidence to charge for that offense. Provost Daniel Diermeier addressed the campus in an e-mail after the incident, saying that the administration supported taking action to the “fullest extent of the law” against the suspect. 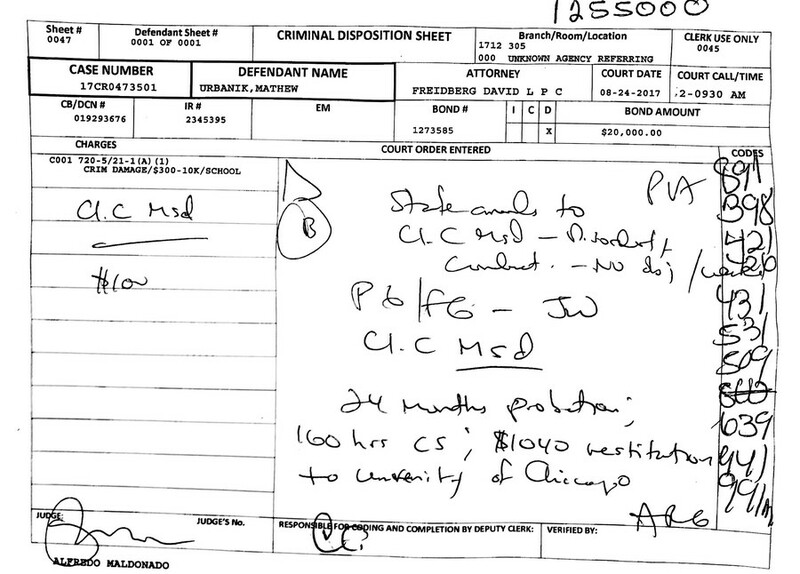 Urbanik was arrested by UCPD several days later. Urbanik’s flyers, posted on March 9, suggested that LGBTQ people should commit suicide, called for a “white revolution,” stated that “black lives don’t matter,” and included the use of slurs. Video surveillance showed that at least 13 flyers were posted on University buildings, according to the arrest warrant. The posters included branding for a neo-Nazi group called the “Atomwaffen Division,” and they linked to the group’s web forums. Atomwaffen claimed credit for a different round of racist and anti-Semitic posters that were found on campus in December, and Urbanik’s arrest report stated that he was also responsible for hanging those posters. Urbanik’s attorney David Freidberg said Wednesday that they do not have any comment. The University did not return a request for comment. The damages allegedly totaled more than $1,000. Bail was set at $20,000.